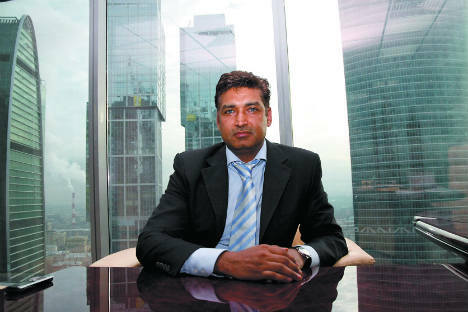 When Vikram Singh Punia entered pharma business in Russia in 1997, there were sceptical sniggers. He now heads a thriving company, with ambitious growth plans. Pharmaceutical industry topped the list of subject discussed during the recent 5th Indo-Russian trade and investment forum in Moscow. “And it's not surprising,” says Vikram Punia, the head of pharmaceutical company Pharmasynthez. “I think this event helps us not only to find business partners, but also produces concrete results. Previously, it helped us to launch the production of medications for treating oncological diseases,” says Mr.Punia, an Indian businessman who is making a mark in Russia’s business landscape. The Indian pharmaceutical industry has seen rapid advancement of new technologies, stressed Mr. Vikram, who has worked in the pharma business for 15 years. Educated in the Irkutsk Medical Institute, Punia believes that sharing the experience of Indian chemists and technologists can be useful for the Russian market. He points that the price of generic medicines made by Russian producers are several times higher than the Indian ones. But while keeping pace with the fast progress of new technologies, he says, it’s essential to make the best usage of the drugs already in production. “Although innovations are important, we shouldn’t forget that 90% of diseases can be cured using existing medications,” he points out. Mr. Punia stresses that although Indian companies are keen to foray into the burgeoning Russian pharmaceutical market, there are some peculiarities that should be taken into account. "Firstly, Indian partners sometimes display a conservative approach and are reluctant to make direct investments as they are afraid of risks,” he explains. "And that's where our company comes into the game acting as an intermediary." He attributes the success of his enterprise to his penchant for taking risks and moving ahead. Besides, there are sometimes delays and difficulties in getting visas and permission to work in Russia that create impediments for the Indian companies’ activities in the Russian pharmaceutical market, he says. But being an optimist, he adds that those obstacles can be overcome provided one has enough patience and persistence. Vikram Punia distinctly remembers his first steps in the pharma business in Russia. “Indeed, 1997 - the year when I started my business - was a tough time for the country and especially for launching a new enterprise." In those days, many people, he recalls, simply couldn’t understand his decision to invest so much money in the production of medicines. “They asked me: why can't you just follow the example of some other businessmen and simply buy from abroad and resell?" he says. But Punia decided to take the plunge and started to produce anti-tuberculosis drugs in 1999 right after the severe economic crisis of 1998. To begin with, he opened two factories in Irkutsk. Currently, 80% of anti-tuberculosis medicines are produced in Russia. Mr. Punia is confident that medicines related to oncology and diabetes, which are mostly imported by Russia at the moment, are to follow suit soon. No wonder, Vikram is upbeat about Pharmasynthez’s plan to scale the turnover to $250 million by 2015 from $100 million. Punia’s business success has an interesting personal backstory. In the 1990s, he was not sure of permanently residing in Russia and making his career here. He shares his memories of having entered the medical college in Delhi and then deciding to study in Russia without making long-terms plans to stay in this country. However, fate had other plans. His marriage during his second year at the Irkutsk medical institute, combined with his intense dislike for heat, he adds half-jokingly, sealed his decision to start pharma business in Russia. The entrepreneur is also upbeat about the encouraging attitude of both Indian and Russian governments about developing pharma industry.